Much like the golden age of Hollywood, new advances in technology have cleared the path for today’s golden age of online video, empowering brands and small businesses alike to create video content like never before. However, unlike the 1930s, when new audio and filming improvements ushered us out of the silent film era, today the reverse is true. New improvements in mobile hardware and data plans have led to a video-first world that is largely mobile too, which means that your customer is quite literally not listening anymore. The good news, however, is that they’re willing to watch your content instead, and a new Animoto survey shows that marketers are largely ahead of the curve on this behavior. 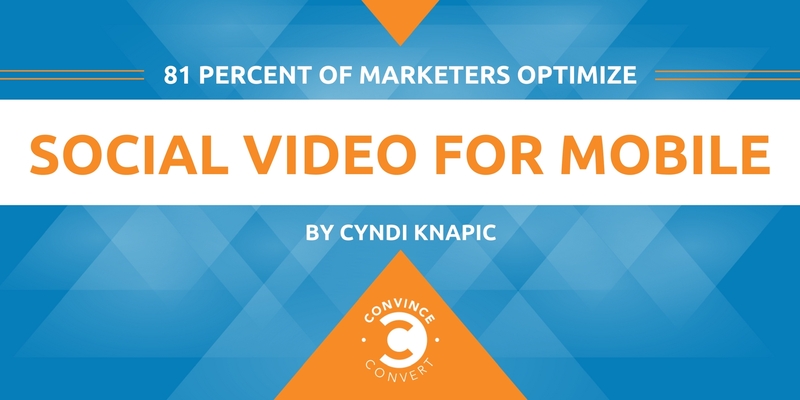 Of the 500 marketers surveyed who work at companies that have created at least two videos in the last year, 81 percent of marketers are optimizing their social videos for mobile viewership, including 39 percent that are creating square and/or vertical videos. Moreover, 67 percent of marketers use text over imagery, and 51 percent of marketers use closed captioning most of the time or always when making videos. On the consumer side, 39 percent of the 1,000 consumers surveyed say they are more likely to finish videos with subtitles. Why? Because an overwhelming 85 percent of consumers report watching videos from their mobile devices, which means that they can bring their screens with them wherever they go. For example, you can personally find me watching videos on my phone while waiting in line for coffee, on the subway, and/or scrolling through my news feed in bed before I go to sleep. And it appears that I’m not the only one. 33 percent of consumers say they watch videos during their lunch hour, 43 percent in the afternoon, 56 percent in the evening, 38 percent before bed, and 16 percent in the middle of the night. All of this video viewership represents an exciting new opportunity for marketers because they can now reach an audience any time of day. Never before have brands had this much access to get marketing videos and ads in front of consumers. For example, 60 percent of the consumers surveyed say they watch branded videos on Facebook every day. In fact, Facebook is the top spot where consumers are watching videos daily. Additionally, they’re spending time on new platforms such as Instagram Stories and Snapchat too, which took the second and third spots respectively. Interestingly, when it comes to live content, slightly less than half (48 percent) of consumers prefer live video to edited video (52 percent). To illustrate how video is making an impact in today’s golden age of online video, Animoto has published an infographic that you can find below. Are you and your team staying ahead of the curve and already creating videos that are optimized for mobile viewing? Share your tips in the comments below. This post is part of a paid sponsorship between Animoto and Convince & Convert. As the Head of Animoto for Business, Cyndi Knapic leads the company’s strategic efforts to make it easy for marketers to quickly create professional videos for websites, email, and social media to promote their business. Animoto has millions of users that span the globe and create over 1M Animoto videos every month. Prior to joining Animoto, she worked in Marketing at AppNexus and is a lead organizer for Startup Weekend events in NYC.